Summer is whizzing by. They always talk about how kids these days are overscheduled; I think the same goes for adults. Last week, we finally had a chance to catch our breath and create a light summer meal at a relaxed pace. Summer’s bounty has been coming in strong at the farmer’s market, so I wanted to take full advantage of all the fresh vegetables I could – cucumbers, cherry tomatoes, hot peppers and lettuce. When it came to a protein to pair with everything, shrimp seemed to fit the bill for something summery that wouldn’t weigh us down. A little bit of sweet barbecue sauce brought all the ingredients together. I served this refreshing summery combination of BBQ sauced vegetables and grilled shrimp in romaine lettuce leaves. It was a refreshing meal for a humid summer evening. It was filling while not weighing us down. It was healthy without making us feel like we were missing something. And, maybe, most of all, while it might have come together quickly, it wasn’t rushed, and we were able to savor every bite. 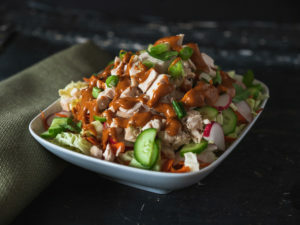 In a medium-sized bowl, toss together the diced cucumber, quartered cherry tomatoes, minced jalapeno, a pinch of salt and black pepper and 2 tablespoons of the BBQ sauce. Divide the mixture evenly among the four romaine lettuce leaves. Set aside. In a separate bowl, toss the shrimp with the remaining tablespoon of BBQ sauce. Grill the shrimp over medium-high heat until fully cooked (pink and tightly curled). 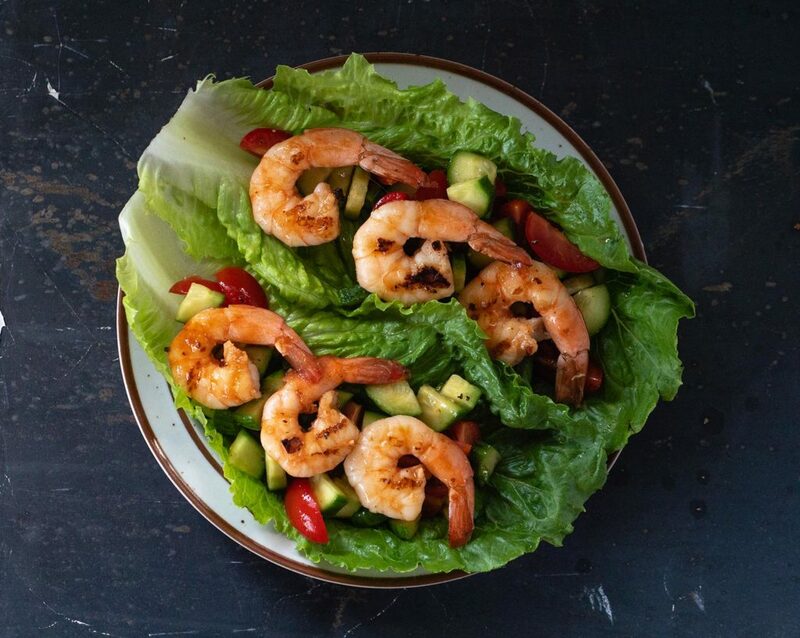 Place three shrimp on top of each vegetable-filled lettuce leaf and serve immediately.